Measure water and vinegar into a large pot and bring to a boil. NOTE: remember to multiply the recipe for the number of colors. For example: if you will be using 6 dye colors...put 6 cups of water and 6 tablespoons of white vinegar into the pot. DO NOT ADD ANY DYE AT THIS POINT. You can boil more water/dye solution if you want to have extra...as long as you keep the ratio (1 to 1) the same. 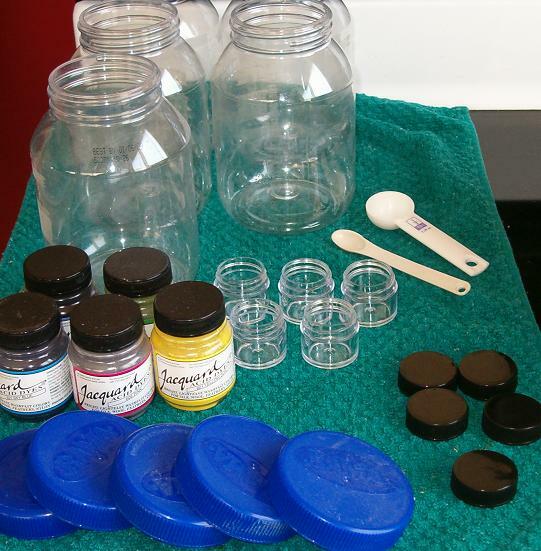 You need jars for mixing the dye solutions. Here are my supplies when I get ready to mix my acid dye. 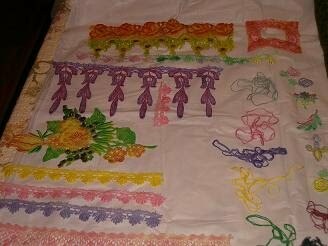 For this batch of lace, I am using five colors. So, I have five little jars for the dark mix and five larger jars for the medium mix. You don't need quart jars...that's all I have on hand. Here is the yellow mix completed. You can see that only a small part of the quart jar was used for the medium shade, so pint jars would be fine. 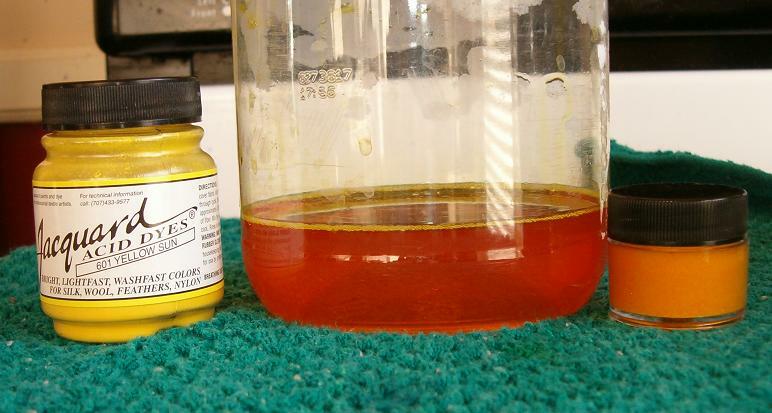 You can also see that the Sun Yellow color of dye looks more like an orange when it is mixed with the water/vinegar. But, it will be yellow when it is painted on the lace. 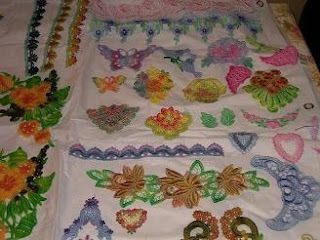 You will also need other supplies when you get ready to paint your lace. However, your dye can set for a day or too before it is used...so you can mix your colors ahead of time. The other supplies you need once you get ready to dye/paint are paper towels, artist paint brushes, old terry cloth towels as a work surface (or some other substitute), small containers to hold the dye while painting, larger containers to hold a weak dye bath and clear water. You will also need disposable rubber gloves if you don't want your fingers/nails to be dyed! Once you mix your dye colors, you should have left over vinegar/water solution. This will be used to wet your lace and to clean your paint brushes...so pour it up into a jar as well. STRONG COLOR: Mix 1/4 teaspoon of the dry acid dye color into a small container and add 1 teaspoon of hot vinegar/water solution. MEDIUM COLOR: Mix 1/4 teaspoon of the dry acid dye color into a medium container and add 3/4 cup of hot vinegar/water solution. WEEK COLOR BATH: Pour 1/4 cup of the MEDIUM COLOR solution (that you just mixed) into a glass bowl (glass won't dye where plastic bowls will pick up the color). Add 1/2 cup of hot vinegar/water solution. You will mix each color of dye separately. Do not mix them together, or you will just have a huge jar of brown yucky dye color. My most favorite little containers to use for painting with dye are sauce cups. You can ask for the disposible ones at your local fast food chains. I get stainless steel ones from Sam's Club...and they cost about five bucks for a dozen! And they don't stain with the dye! CAUTION: Don't use any jars, bowls, measuring spoons, etc for dying that you would then need to prepare or serve food in!! Powder dyes are not to be ingested...so also read your product labels before using. 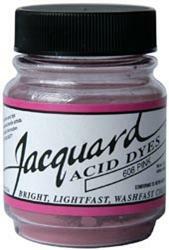 So, to recap...at this point...you should have three dye solutions for every acid dye color you are using...a strong, medium, and weak. Next, set up your work station with an old folded towel or something disposable you can place your lace upon to paint it. Here are photos from a dye process my friends (Pam and Francis) and I had last week. This is our playground! You can see the dye is still in the jars at this point. 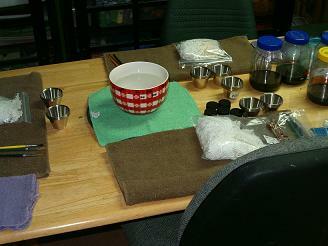 The little stainless steel cups are ready for us to pour some medium and dark dyes into. Our lace is still in the baggies. The large red bowl in the center has hot vinegar/water solution in it, ready for the lace to be wet before we paint it. One small stainless steel cup will also hold clean vinegar/water solution for us to wash our brush out after each color of dye we "paint" on our lace. 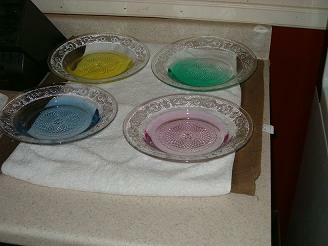 Here are the glass bowls we used for the weak dye solution. We decided to only use four of the colors, as we were not big fans of purple lace. We poured each of us a stainless steel little container with each of the medium and the dark color solutions. Since we used five colors...we each had ten little cups of dye...and one little cup of clear solution. So, the next step is to get busy! 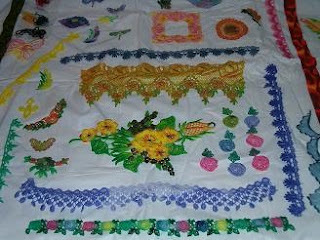 We wet each piece of lace as we worked with it, instead of wetting all of them at once...saving us room on the table. 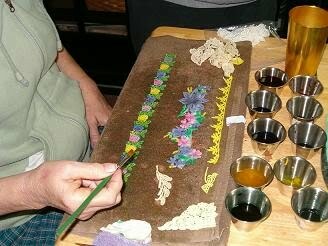 Here is Francis painting some of her lace pieces. As you can see, she has a yellow piece that she wanted to be only that one color. 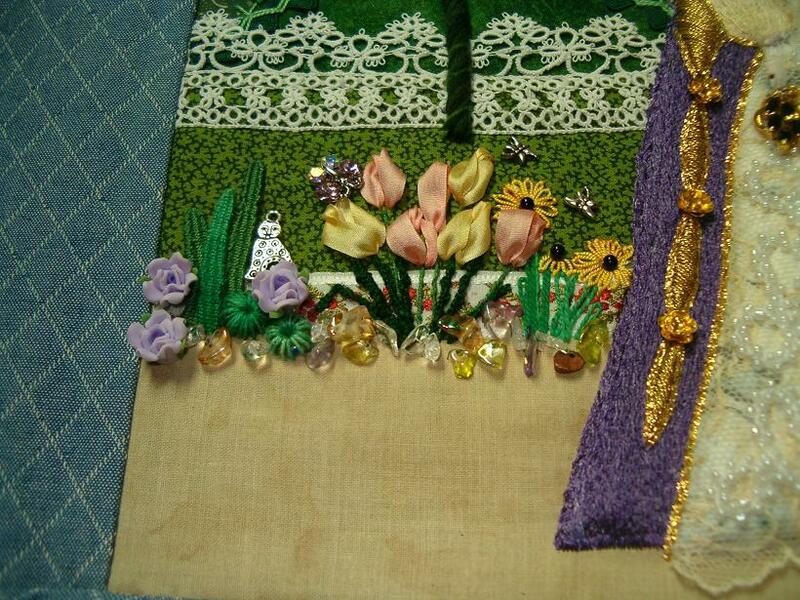 Then she has a floral in pink/purple/yellow with green leaves. 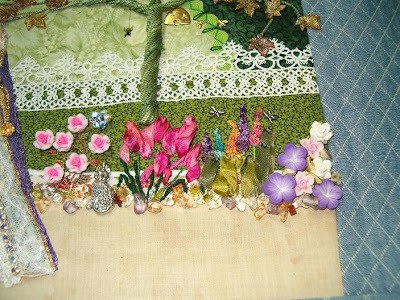 And she is working on a piece of floral trim in shades of blue, pink, yellow with green leaves. Use the weakest dye bath to submerge the lace after it has been painted...before it has been painted...or both! This will help to blend your colors together. 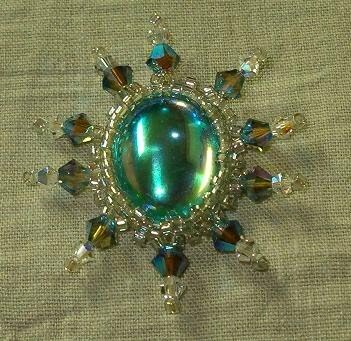 But, it will also alter your colors...so experiment with lace you won't mind "losing" before you tackle your most favorite piece. You can paint the colors on the lace using the dark and medium solutions to obtain multi-colored lace pieces. 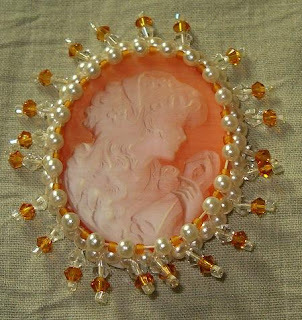 Or, you can just use one color...and paint the lace with the dark shade and the medium shade...then "dunk it" into the weak dye bath of that same shade to get a beautifully shaded single color piece of lace. CAUTIONS: Remember what you learned in school. Yellow and red make orange. Blue and yellow make green. Blue and red made purple. And mixes of these makes brown! So work within the colors that can be mixed when every possible...or at least, keep them side-to-side so you get a pleasing design when they do blend...and not a yucky patch of brown! BUT, all is not lost it that happens...just dunk the entire piece of lace into a strong medium color...and you have a solid piece that color shade! Play around with the shades. If something is too orange...paint some more pink/red into that area. If somethink is too pink, add some blue to make it purple! 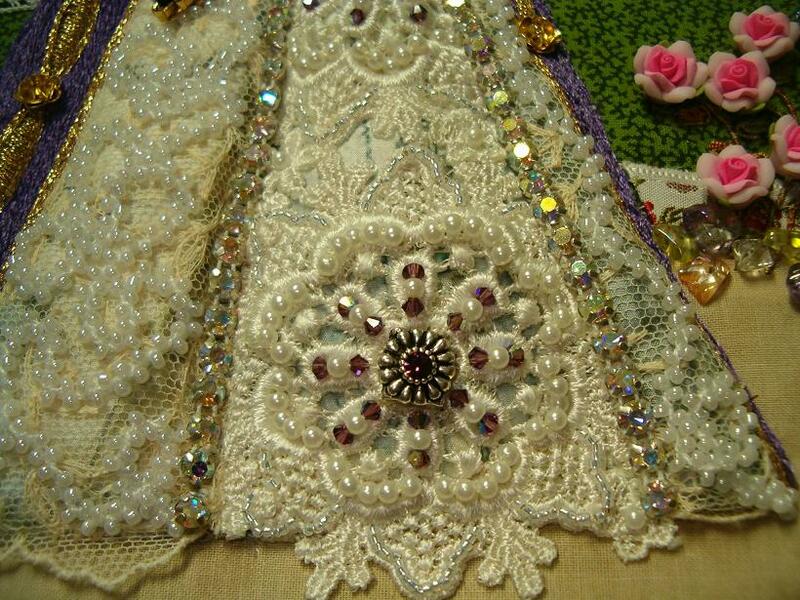 When you create a piece of lace you love...WRITE DOWN what you did!!! You will forget those mixes of colors and the steps you took to get that gorgeous result the next time you dye if you don't...ask me how I know!! 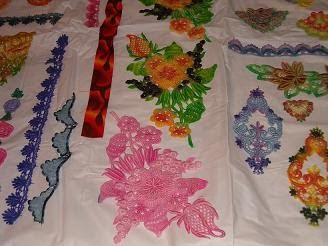 Here are some of our dyed lace pieces. Francis, Pam and I agreed we did not like some pieces...but on the second day, after we had allowed them to dry...and after we rinsed and ironed...We agreed that we LOVED all of them! The photo on the right is lace that Pam painted. 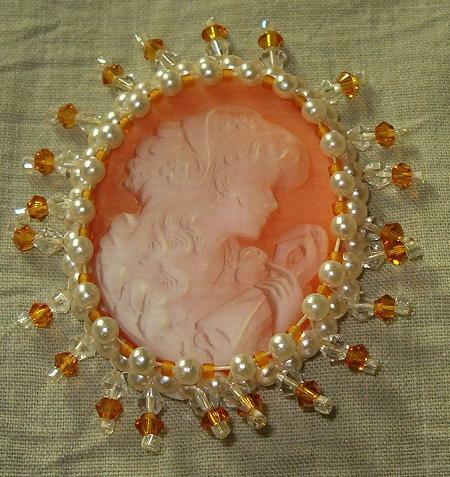 I love her pink and yellow photo frame and her large piece of rose trim is wonderful. The camera does not capture the color in that well however. The variegated blue piece was created with the last of our blue dye, just dunk and wring out...some got more dye than others...and we loved this little "surprise". 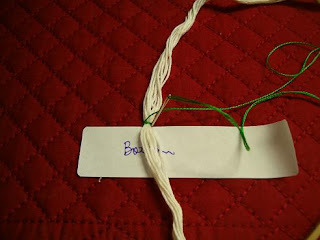 Francis dyed some cotton threads along with her lace. 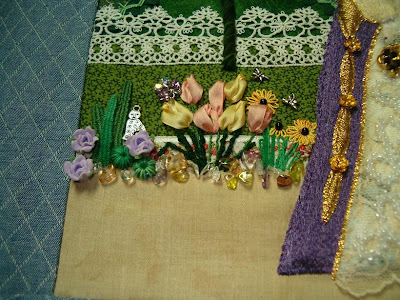 The purple large trim piece actually has some pink in the center...and it is going into a mermaid crazy quilt block. 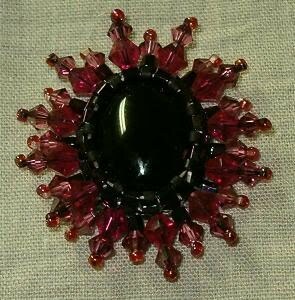 The large rose trim piece at the top is stunning...again the camera doesn't capture that! And you can see lots of colors of shell trims at the bottom. These will also go into Francis's mermaid block, as will the pink piece. And lastly, here are mine. I had no specific plan for any of mine, so just played with colors. Francis, Pam and I had great fun dying these. We are not professional dyers...by any means!! So, I feel that anyone could get good results if they have some time and patience. Start with your least favorite laces...do them in shades of one color. Try adding a second color..play around! ETA: For those who are wondering what color of dyes these are. We used #629 Emerald, #621 Sky Blue, #608 Pink, #601 Yellow Sun, and #612 Lilac. Testing: Here is the pdf of the tutorial. Having a better day...decided to put away all the business stuff, and the quilt show stuff...and stitch! Yeah! Well, kinda stitching...it did involve a needle and thread. 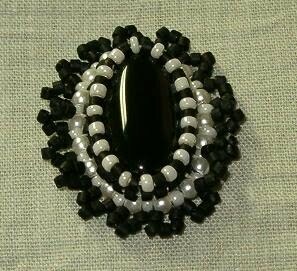 I made some new cabochons for the Studio. Then, forgot to take a photo of one of them..so it will have to wait until tomorrow for uploading...but these others are gonna go up tonight. These took two days to complete, so not a bad production time! 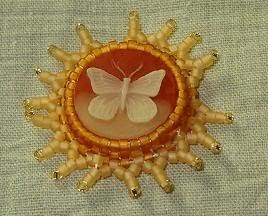 With my other daily routine things, I'm beading a cabochon in about 2-3 hours; depending on the size. I can live with that! Okay, edited to add this last one...her name is Rubies! 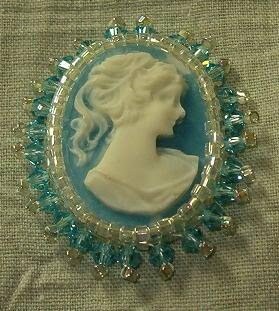 Cabochons have a flat back. 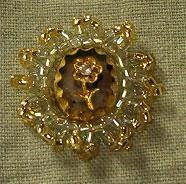 They can be adapted to wear as a brooch with a pin clip and a little glue. But, mine are really created to be used on crazy quilts. They can easily be couched in place by stitching over the fringe right next to and around the cabochon. Even the fringe could be stitched down by stitching through the last bead again if you wanted the "rays" to be tamed...but I like the dimensional look of them being free to move a little. I've been asked about the technique used to make trees like the ones in the Queen's Garden below. I use this technique often, and it is so easy...you just won't believe it! 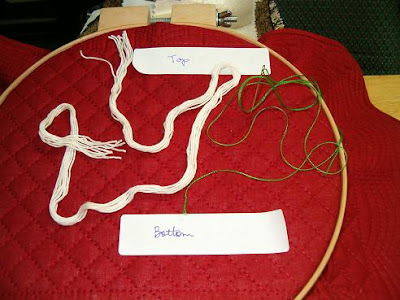 To begin, hoop your project so your work area is nice and flat. For this tutorial, I just hooped a placemat as my work area. Next visualize where you want the bottom and top of your tree. The photo has labels to show my bottom and top points...but you can just remember where you want yours. You will need the thread you wish to make your tree trunk from. I have used all types of fiber, yarn, and threads for this technique. Your choice will depend on the type of tree you are considering...birch would be good in white and black yarn...pine would be in browns...etc. For the tutorial I have chosen white so it will show up well in the photographs. Next, you need to select your stitching thread...for the tutorial I will use green so it will show up; but, in "real life" I would have chosen the same white thread as the trunk is made of. 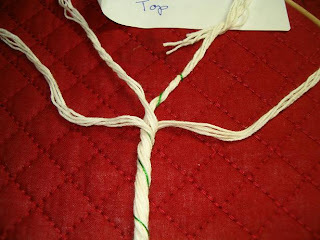 Next, take the threads you want your tree trunk made from, fold them in half and find the middle. Lay them vertically with the middle point at the bottom point of your tree. Stitch over this group, couching the bottom in place. The amount of threads you use for your tree will partially determine how big it is. You can take several in your hand and just twist it to see how big around the trunk would be...too big?...take a few away; too little?...add some more. You want to have enough to create a good solid tree. Another trick, is to twist the trunk tighter to make it smaller...with a lot of threads used. 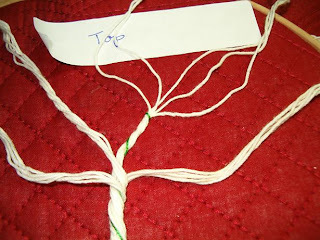 Next, bring the threads together and twist to form the trunk. Pin this vertical trunk at the top to hold in place. I pin a little on the right then on the left...like holding a corsage in place. If you are left handed, you probably twisted your tree counter-clockwise...while right handers usually twist clockwise. Either will work...you just need to look at the directions of the twist for the next step. Bring your stitching thread out at the bottom of the tree. If you twist clockwise, it will need to start on the right side. 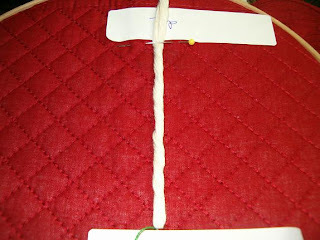 You want your couching stitches to follow the twist so they are hidden as part of the trunk. The bottom stitches in this picture below are a little to horizontal...while the upper ones are more in line with the "twist"..and that is what you want to achieve. Stitch the trunk down until you reach about 1/3 to 1/2 of the distance between your bottom and top. Now, start to open the threads above the last couching stitch...these will be the large limbs of the tree. Determine if you want to continue with a center limb or have all the limbs go "out" at this point. This will depend on the type of tree you are trying to depict...and the area you have to cover on your project. As you open the tree up...couch the major limb down. Continue to couch all the major limbs down. You might have to use more than one needle/thread...or just move around on the back of your work. 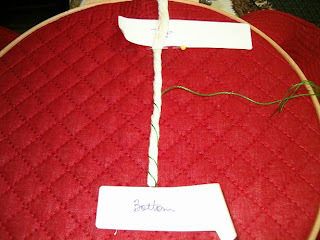 Next, open the individual threads up to make tiny limbs. These can be couched some. Lastly, thread each thread individually into your needle and pull to the back so that the tip of each tree branch ends where you want them. Viola, you have the structure of the tree!! 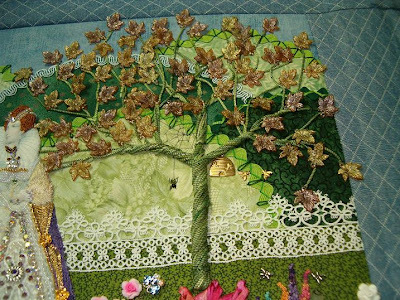 Now, stitch leaves...add leaf beads...add leaf sequins...add flowers...let your mind and needle bring your tree to life! The past few weeks, I have been working on this tote bag. I could not post about it, because it was my entry in the Crazy Quilter's International Yahoo Group purse contest for 2010. But, the contest is now complete, so I can share a few pictures with my followers. The contest had some super great entries, and it was a great honor to be considered in the running with these pieces of needle art. And, I'm blushing proud of my "lady" because she came home with the 1st Place ribbon. My mom was so proud! She saw the hours and hours of short-long thread work I put into the sleeves and coat. 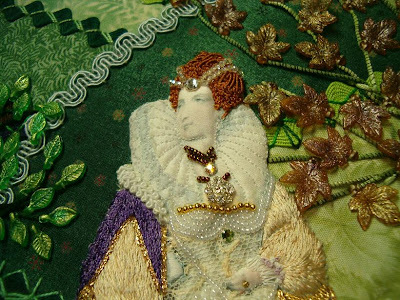 The hundreds of French knots and the bullions in the hair. The beads were a different story altogether...and are too numerous to count. 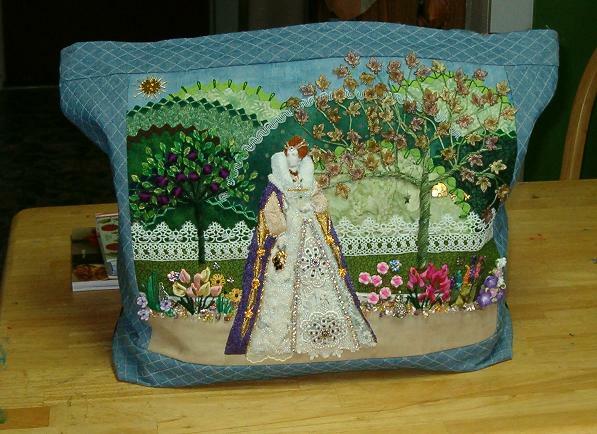 Each was securely stitched because I plan on using this tote! It has already make a couple of trips to town with me! So, hope you enjoy the photos!